Location: 18 Km. from district headquater in Hajipur, on Mahnar Road. 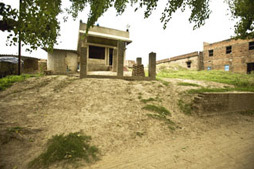 Importance: As per Mahanivannasutem & Buddist literature this place was known as 'Kotigram in Buddhist period - where Lord Buddha used to take rest on his way to Vaishali, after crossing the Ganga from Patliputra side. Anand, the famous desciple of Lord Buddha, attained 'Maha Parinirvana' close to this place. His mortal remains are said to be enshrined under a 'Buddist - Stupa at Bajidpur village. This is the place were king Vishal founded the city of 'Vishalpuri' after his own name. And this was the place where sage Vishwamitra got down from the boat on the northern bank of the Ganga after crossing from Rajgir side and stayed for the night, vice cantos 45 to 49 of Valmiki Ramayana. Chechar, Kutubpur, Bajidipur, Mathurapur, Navanagar, Pakauli, Kanchanpur, Bidupur, Bhairopur, Kilwat, Bihwarpur, Kataharia, Ramdauli, Ameer, Majalispur, Gopalpur, Baghsaiatkhan, Khalsa, Gobindpur, Maniyarpur, Hasanchak, Mustafapur, Chandpur, Saidpur. Location: 18 Km. 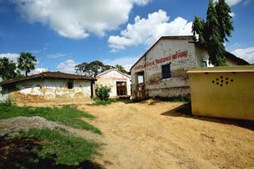 east, of district headquarter Hajipur, 1.5 Km from chechar Museum, on the Mahnar Road, at Chechar Village. 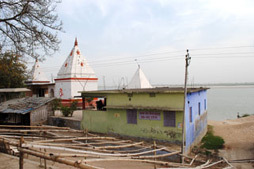 Importance: At the bank of river Ganga Chechar Buddhist Temple is an ancient place. In the temple two rare statues of Lord Buddha are established (of Bhumi Asparsa Madra). These statues were found from the excavation, in t Chechar village. This place is also a natural beauty spot. Location: 15 Km from the District Headquarter Hajipur, 3 Km South of Mahnar Road, situated in the Mathurapurapur Gram Panchayat of Biddupur Block. Importance: It is an 80 feet high mound of earth spread over an area of 1 hectare. At present there is a Hindu Temple situated at this place. This place is known as a Stupa of the Ashokan era, which was built by King Ashoka on the original Mortal Remains of Lord Buddha. 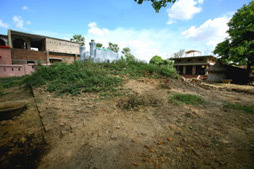 On top of the Stupa, ruins of ancient Buddhist Monastery can be seen even today. These ruins were discovered while the top of the mound was being flattened in order to construct the temple. At this place, a rock with the engraved foot print was found during the digging of a well. 270 years after the Mahaparinirvana of Lord Buddha, Ashoka collected three-fourth of the original Mortal remains of Lord Buddha from seven different locations and further divided it into 84000 parts and built Pillars and Stupas at 84000 places along the Nirvana Path of Lord Buddha (most of these Stupas were built of clay). It is believed that this Stupa is one among them. Later a Buddhist Monastery was built at this place between the Buddhist Period – Gupta Period. Location: 15 Km from the District Headquarter Hajipur, 3 Km South of Mahnar Road, on the banks the river Ganges, situated in the Bajidpur Gram Panchayat of Biddupur Block. Importance: It is a 15 – 16 feet high mound spread over 1.5 acre where Government Middle School, Bajidpur is now situated, it is believed that at this place in the Buddhist era, there was the Stupa of Anand, main disciple of Lord Buddha. However, it is disputed because there is another legend that claims that according to Buddhist Literature, Anand, after Buddha’s Mahaparinirvana (543 BC) after serving Buddhist Monasteries wanted to aatin Nirvana in Vaishali & thus desired cross The Ganges to attain Nirvana on the other side. On hearing news Magadh King Ajatashatru came to him & requested him to attain Nirvana in Magadh. By then Lichhavi had also crossed the river Ganges, therefore, Anand could attain Nirvana at his desired place. Considering this, Anand in order to avoid a war between the two states, immolated himself in the middle of the river Gange with the help of his yogic power. Thus half of his mortal remains went to the Republic of Lichhavi and the other half went to the Kingdom of Magadh. With the half of the mortal remains Lichhavi constructed ‘Anand Stupa’ in Vaishali and Ajatshatru constructed another ‘Anand Stupa’ in Rajgir, Nalanda. 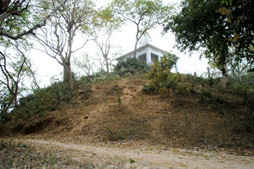 This place was acclaimed as Anand Stupa with the help of; Dr. Yogendra Mishra, Dr. Jayshree Mishra, Department of History, Magadh University, Patna and Narendra Pal Singh, IAS (In search of Kotigram). Location: 15 Km from District Headquarter, Hajipur, situated in the Kutubpur Panchayat of Biddipur Block. 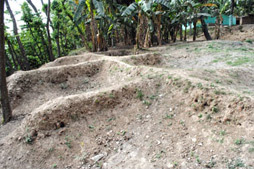 Importance: It is an 8 feet high mound spread over an area of 2 hectare. It is believed that this Stupa was built on the Mortal Remains of one of the four main disciples of Lord Buddha, Mridaglayayan. At present there is a school being run here. In the period of 2500 years, this mound is on the verge of disappearance. Location: 15 Km from District Headquarter, Hajipur, situated on Mahnar Road. Importance: Situated in Chechar village, this Stupa is believed to be of the Ashokan era. This Stupa is situated between the Chechar Buddhist Temple and the first excavation site. Many important historical remains have been found from this place, which include tools of copper and bone, gems ancient coins, terracotta, pieces of utensils, statues of stone. Importance: In the exaction in 1978 by the Archeological Survey of India many important historical remains have been found from this place, which include tools of copper and bone, gems ancient coins, terracotta, pieces of utensils, and statues of stone. These are now collected at Chechar Museum. At present there is Bazaar situated at this place. Importance: In the exaction in 1989 by the Archeological Survey of India many important historical remains have been found from this place, which include tools of copper and bone, gems ancient coins, terracotta, pieces of utensils, and statues of stone. Besides these, the other import findings are the Arrow head, terracotta of Helena, Daughter of Seleucus These are now collected at Chechar Museum. 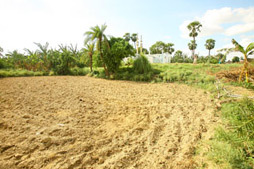 During survey excavations, traces of Buddhist Stupa were also found here. 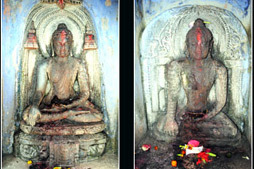 It is situated 18 Km east of the District Headquarter, Vaishali, 1.5 Km from the Chechar Museum on the Mahnar road, in Chechar Village of the Kutubpur Panchayat of Biddupur Block, on the southern bank of the river Ganges, in the North-Eastern direction, Chechar Buddhist Templeis an extremely important religious place. There are two very rare statues of Lord Buddha in the Land-Touching Posture (31 Inches High, 14 Inches in diameter, 19 inches at the base and 46 inches high, 14 inches in diameter , 21 inches at the base respectively) situated in this temple. These statues were found in the erosion inside a mosque on the easter side of the temple. There are many statues conserved inside and outside of the Buddhist Temple. In this temple complex there are temple of Lord Rama on the northern side of the road and temples of Lord Siva and Goddess Durga on the southern side of the road. The natural beauty of this temple situated on the banks of the river Ganges is exemplary. This place requires adequate development and conservation.